There are several multiplication algorithms, one - the Egyptian multiplication - came to us from antiquity and the same is probably true of the Vedic algorithm. Another method - the lattice multiplication - has been brought to Europe in the early 1200s, and the fourth one, known as the Russian Peasant multiplication, was in all likelihood developed much later and appeared in relatively modern times. A curious model of multiplication that was reputedly devised by a Chinese teacher has been making rounds on the Internet is probably not older than the Internet itself. Except of the Vedic variant, none claims a divine origin. The multiplication scheme that everyone learns in school, the one that is often referred to as the traditional multiplication algorithm, is likely to have evolved from the lattice multiplication. As the Western world has been growing accustomed to the decimal system, so the arrangement of intermediate results became more compact and eventually formed a column of numbers whose sum gave the expected product. This, now indeed traditional, multiplication scheme is known as the long multiplication and in some place column multiplication. 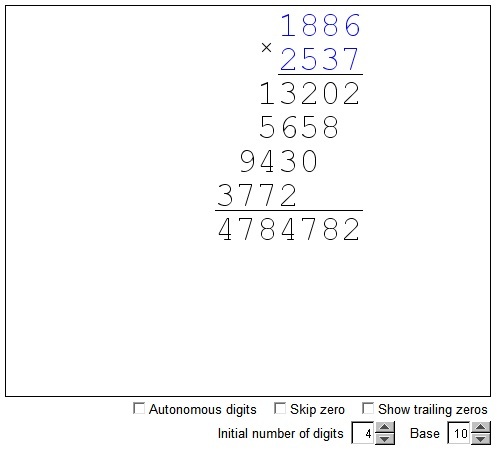 The applet below offers an interactive version of the long multiplication. The two multiplicands appear in blue. There digits can be changed by dragging the cursor a little off center of each. The digits can change autonomously so that each will cycle through the values 1, 2, 3, ..., 0, or be made (the default) a part of the integer string so that, for example, if a digit changes from 9 to 0 its neighbor to the left accepts the carry of 1. The length of the multiplicands is controlled by the Initial number of digits spin, but also may change as the number itself changes.